Thanksgiving is upon us, and that means it’s time to get merry! Fortunately here in Clinton County, Illinois, that’s easy thanks to a bevy of cheery holiday events. Pull out your calendar and mark these down—they’re too festive and fun to miss! Christmas in Carlyle kicks off Friday evening with the lighting of the Christmas Lights in City Park, followed by a parade led by none other than Santa. After the parade, all are invited to enjoy fireworks—a brilliant display and perfect way to start the holidays! Breakfast with Santa is an annual family favorite at Bretz Wildlife Lodge & Winery. Mr. and Mrs. Claus will be on hand to meet the little ones, and everyone can savor the delicious buffet menu. Breese Christmas Parade and Fireworks. Things get festive the Saturday after Thanksgiving with the annual parade through downtown Breese. Join the fun to welcome Santa, then visit him in Santa’s Hut throughout the holiday. Shop the local businesses and get a chance to win Silver Bell Prizes; and enjoy a Tour of Lights the week before Christmas. Annie. Gather the family and head to the Clinton County Showcase for a performance of this beloved musical. The heartwarming story of a little orphan girl who escapes to New York City and finds a home with a billionaire is a feel-good classic. Saturdays, 7:30 p.m.; Sunday matinee, 2:30 p.m.
Brunch with Santa. Hidden Lake Winery pulls out all the stops for this festive feast that includes a carving stations with ham and beef, roasted chicken, eggs, French toast, delicious sides and an assortment of pastries. Oh, and there’s wine too, of course! Christmas Basketball Tournament. This is the best reason we know to pull yourself away from Christmas toys! The annual tourney pits the best area teams in what is always a fun-to-watch battle. 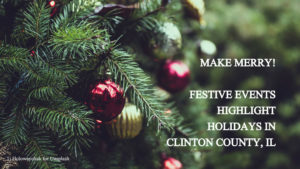 Have yourself a Happy Holiday in Clinton County! This entry was posted in Events, Holidays, Local Businesses, Music & Theater, Shopping and tagged Carlyle Lake, Clinton County event, Clinton County tourism, Holiday event by admin. Bookmark the permalink.